Tags: A-line, Front Open, Rust, Shirt, Straight Trouser. Top: Rust A-line front split shirt having delicate embellished on front and sleeves.Stand collar with keyhole neck. Full sleeves with button detailing on cuffs. 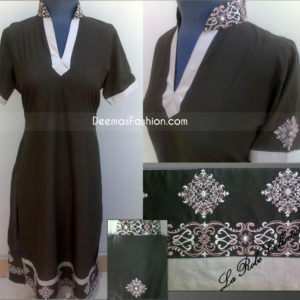 The shirt has applique work of rust silk on hemline, sleeves and collar. Trousers: Rust silk plain straight trousers.